David Bowie, perhaps best known for sleeping with everyone and everything in the ’70s, is co-writing Lazarus, a theater production based on 1976’s The Man Who Fell To Earth. 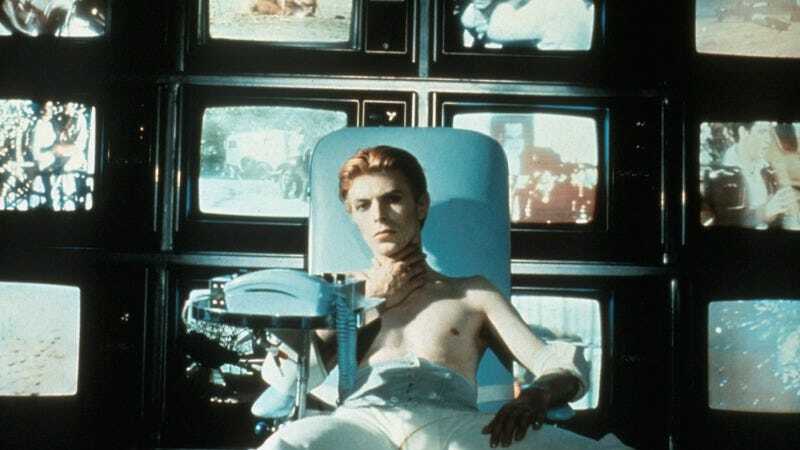 The Man Who Fell To Earth is a 1976 science fiction film directed by Nicholas Roeg; Based on Walter Tevis’ 1963 novel of the same name, the film tells the story of an alien who lands on Earth seeking a way to ship water to his planet, which is experiencing a severe drought. He goes about it in a much nicer way than the Visitors from V, who just wanted to steal all of our water and eat all of our rodents. The film marked David Bowie’s first starring role as the extraterrestrial, who goes by the exotic interstellar moniker of Thomas Jerome Newton. Pitchfork reports that Bowie will co-write Lazarus with Enda Walsh, who won a Tony Award for the stage adaptation of 2007’s Once. The new play will also feature new music from Bowie, as well as new versions of older tunes. (The 1976 film did not feature any Bowie songs due to contractual obligations; instead, the film featured music from John Phillips of the Mamas & The Papas, as well as Japanese percussionist-composer Stomu Yamashta.) Although the play is Bowie’s brainchild, he does not plan to star. Lazarus will open later this year.